SNV regularly commissions evaluations of a selected group of its projects. In 2014-2015, SNV is commissioning two project evaluations in each of its three main sectors of work. These sectors are Agriculture, WASH and Renewable Energy. This request for proposals covers the evaluation of SNVs Sustainable Sanitation and Hygiene for All Programme in Cambodia. The evaluation will take place in the period March 2015 – September 2015. In case you are interested in conducting this evaluation, please have a look at the Terms of Reference. In a new video, Mayadevi and Kaman (Nepal), Toan and Thinh (VietNam) and Tshering, Drukda, Tashi and Deschen (Bhutan) share stories about women’s participation, leadership and their changing roles in promoting sanitation and hygiene in Nepal, Bhutan and Viet Nam. The video is from SNV’s Sustainable Sanitation and Hygiene for All Programme (SSH4A), which has been implemented by local governments and partners in 17 districts across Nepal, Bhutan, Laos, Viet Nam and Cambodia since 2008. It aims to provide one million people with access to improved hygiene and sanitation facilities by the end of 2015. As the approach aims at addressing access to sanitation for all, addressing gender issues and inequalities is key. SSH4A is a partnership between SNV, the Governments of the Netherlands, Nepal, Bhutan, Laos, Viet Nam and Cambodia in Asia and the IRC International Water and Sanitation Centre with support from AusAID and DFID. In Bangladesh, IRC is supporting BRAC to measure behavioural change in the BRAC WASH II programme. 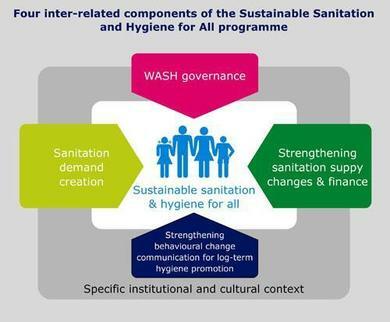 Christine Sijbesma of IRC International Water and Sanitation Centre and Mahjabeen Ahmed of the BRAC share their thoughts and experiences with monitoring sanitation and hygiene behaviour of women in the programme in a recent blog post . The QIS monitoring system that is being used gives special attention to gender and sanitation. First because many of the indicators differentiate between women and men. Secondly because data collection for each sample is duplicated by a male and a female monitoring team. Interestingly, preliminary results show that virtually all the male and female monitoring teams members gave the same scores for the gender indicators.